In this tutorial, you will learn how to build a procedural mesh of your room and add physical interactions between virtual objects and the real world. Spatial mapping captures a mesh of your environment, letting virtual elements interact with it much the way they would with the floors, walls and other objects in a video game. It allows you to use Unreal’s built-in physics engine, adding convincing physical behavior to virtual objects. This way, they can collide with the real world, bounce off of it in appropriate directions, accelerate correctly and be affected by gravity and other forces in the real world. Follow the steps in Build your first MR App if you don’t know how to create and setup a new project. To use spatial mapping you will need two actors: the BP_SpatialMapping_Manager to scan and retrieve the mesh and a procedural mesh to create and display the mesh in the virtual world. 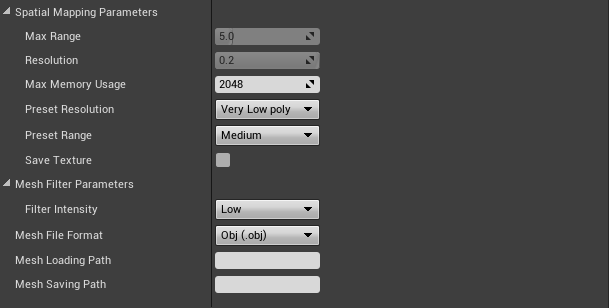 The plugin provides an example blueprint, BP_SpatialMapping_Mesh, to let you see how to use the procedural mesh. Go to Stereolabs Content/SpatialMapping/Blueprint and add BP_SpatialMappingScanningManager and BP_SpatialMapping_Mesh to the scene. Now we need to initialise the scanning mesh actor. Open the level blueprint and initialize the mesh. Now, let’s start mapping the area. Click on the BP_SpatialMapping_Manager in the world outliner. You should see the spatial mapping controls. Click on Enable to initiliaze the spatial mapping, and then Start to start mapping the area. Move your camera around. The mesh should become visible. Once you’ve mapped enough of the room, click on Stop. Click Filter to filter (clean up) the mesh. This process may take some time depending of your settings. When finished, click on Disable to disable spatial mapping. For more details on Spatial Mapping parameters, see this section. During mapping, use the blueprint BP_SpatialMapping_Mesh to automatically generate a mesh of the area and enable collisions between virtual objects and the real scene.